The University of California-Berkeley first built Memorial Stadium atop their campus in 1923 as a tribute to those who died fighting World War I. It’s one of the most beautiful college football stadiums in the country, a gem perched in the Berkeley Hills that overlooks the East Bay, San Francisco, and the Golden Gate Bridge. Problem is, stadiums get old, especially stadiums that straddle the Hayward Fault, a more destructive cousin of the famous San Andreas Fault. Memorial Stadium is quite literally bisected by the fault, which not only means that there is risk of a catastrophic earthquake, but that the stadium is slowly being pulled apart by fault creep. A 1997 study rated the seismic safety of the stadium “poor,” and school officials embarked on a quest to fix it shortly after. Regents told the school to either fix the stadium or find a new place to play. That’s an impossible decision, given that Berkeley is a high-density urban area crisscrossed with fault lines and bound by mountains to the east and the San Francisco Bay to the west. By 2006, Berkeley officials had decided not to try and build a stadium somewhere else or play home games in the Raiders stadium, but rather to completely renovate and retrofit Memorial Stadium and build a new locker room and workout facility underneath it. The school was going to take on a bonded debt of $445 million for the $474 million project, hoping to pay it back by selling 50-year rights to season tickets for hundreds of thousands of dollars. Almost immediately, the project got mired in a series of delays. An infamous tree-sitting protest began on the morning of Cal’s annual rivalry game with Stanford in 2006 and delayed construction all the way until September 2008. A neighborhood association sued the university over potential plans to build a parking garage (there is a comical dearth of parking in Berkeley), and that case wasn’t settled until 2010. The delays, the adjacent American economic crisis, Cal football’s declining on-field relevance, and the UC system’s budget crisis (which prompted $650 million in cuts and 17 percent tuition spikes) turned the incredibly ambitious project into an unholy albatross. Stanford stadium guru Roger Noll warned Berkeley officials that the project was too risky, and he was proven correct in his assessment. By June 2011, only 49 of the 3,000 long-term seats had been sold. By December, the school said that they were $113 million short of their goal. Kansas tried a similar long-term seat plan and they abandoned it after it failed spectacularly. Cal tried to pivot away from the seat selling plan by 2013, but by that point, a gaping budget shortfall was staring them in the face, and that was just from paying off the debt. The Bears now owe at least $18 million per year in interest-only payments on the stadium debt, and that number will balloon to at least $26 million per year in 2032 when Berkeley starts paying off the principal stadium cost. Payments will increase until they peak at $37 million per year in 2039, then subside again in 2051 before Berkeley will owe $81 million in 2053. After that, the school is on the hook for $75 million more and will have six decades to pay it off. The stadium might not get paid off until 2113, by which time, who knows, an earthquake could send the stadium back into the earth or football as we know it might be dead. 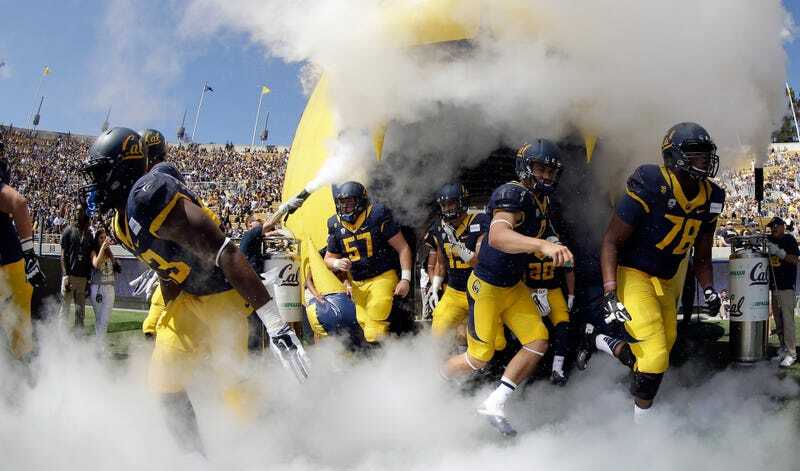 Cal has a historically strong athletics program across the board, with several teams competing for national championships every year, multiple Bears winning Olympic medals every few years, and many high-profile pros in the NBA and the NFL. The school’s 30 teams are the second-most in the Pac-12, and even though Berkeley is more famous for its strong record of academic success, no other public school can stand up to Berkeley’s combination of elite academics and big-time sporting success. However, the current budgetary crisis brought on by the stadium debt is an existential threat to athletics at Cal. Tensions between Cal’s athletics and academics are nothing new, and this situation isn’t helping. The stadium debt is so large that funding may have to come out of the school’s non-athletics budget soon. The school’s largest donors donate to both the school and the athletics programs, and any disruption of sports could decrease the overall amount of donations. The task force issued a report on its findings this week—you can read it below—and while they did not mention any specific remedies, things look incredibly dire. Given its magnitude, it is virtually certain that interest expense will exceed IA’s operating income for the foreseeable future no matter what actions are taken regarding program scope in IA. As the task force made clear, cutting sports might save money, but could also dry up the donor well that the school relies on to pay teachers. If the scope of the program were reduced, what would be the potential savings? To bound the problem, we received estimates that reducing the number of intercollegiate sports from 30 to the NCAA minimum of 14 might produce an initial annual savings on the order of $9- 12 million. In addition, total IA annual capital spending of $7-8 million might decline to $3-4 million. Substantial uncertainty surrounds both of these estimates. Set against these savings is the effect that reducing the number of sports would likely have on philanthropy, not only to IA but also to the entire campus. Development staff estimates that the initial annual impact could be on the order of $25 million. 4 While this estimate is consistent with that made in the 2010 report, this number, like the estimated cost savings from reducing sports, is subject to great uncertainty. Notwithstanding this uncertainty, any recommendation must consider the net cost of scope savings after taking into account the potential reduction in philanthropy. The task force noted that cuts and changes must be made but stopped just short of any prescriptions. Tighter budgetary control is a given, but the school simply owes too much money to avoid taking any drastic measures. The other shoe will drop soon for Cal, and it’s not going to be pretty when it does.